This boat was built by Jim Hampton in the very early 60s and shows the French design trends that influenced many of the Portsmouth boats. 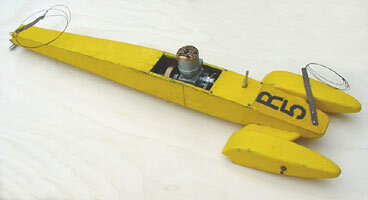 David Winter, a young member of the Club ran the ETA 29 engined boat for a while until other activities took over, but he did keep it until his imminent emigration resulted in it being advertised in Model Boats. 24", but Westbury or Zipper? The line of the cockpit following the deck would tend to point towards the Keil Kraft kit, rather than a scratch built Westbury, but both were very similar in construction. 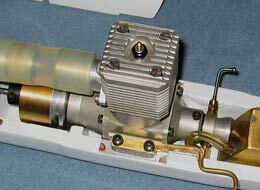 A Frog 500 finished off this ready to run vintage hydro, which sold in Australia for a fiver over £400. This early A2 boat appeared recently and was quickly identified as having been built many years ago by Stuart Robinson for one of the very first rear exhaust OPS 29s. Lack of skeg and mounts means some reverse engineering for the lucky buyer. This remarkable boat and engine was the work of Gunther Stranzinger and recorded over 200 kmh in the 70s! Its current owner, Swiss competitor, Gilbert Huguenin recalls ' I received it from Rainer Halm in desolate condition and made it like new as you can see'. A super restoration and a lovely motor. During the late 70s and early 80s, hulls became shorter as wings came into use and grew in size. The exhaust systems were fully enclosed and the modern boat was born. 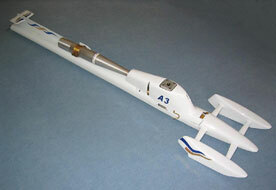 The boat of Nigel's seen here has a large pylon mounted wing, but still the exposed pipe. An aged but unused OPS Redhead has restored the boat to running condition, but not in the UK, as the exposed exhaust is only acceptable in NAVIGA competitions. 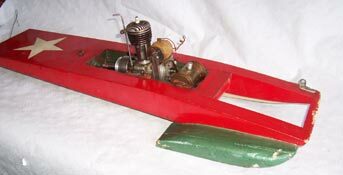 Built and raced in the 1950s by the late Jim Williams of the Bristol Club and originally powered by a Hornet. 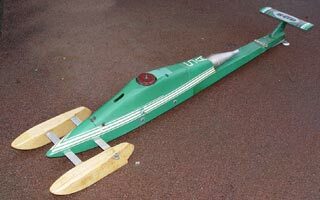 Peter Hill used this hull with a McCoy motor fitted to great effect to win the Lambert trophy twice. Unfortunately around the mid 60mph mark the boat has a habit of flying, so was put into a second honourable retirement. Now re-engined with an early Hornet (not the bulge bypass replica shown) it is ready to be run again, with cautious needle settings that is. 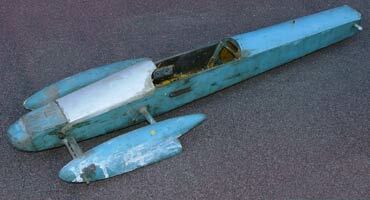 A piece of hydroplane history? 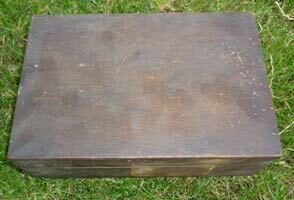 This almost anonymous wooden box has been in lurking in Mike Rose's workshop having inherited it from his father John. Far being filled with odds and ends as Mike had suspected, opening the box revealed a wonderful piece of tethered hydroplane history and memorabilia. What then did this box contain that got both Mike, his son Antony, and OTW so excited? Click here to reveal the mystery. This example of the commercial ED Challenger was found in Scotland and restored by Steve Betney. Fitted with a ED Racer shorn of its exhausts it failed to sell at a couple of swapmeets so was placed on ebay. 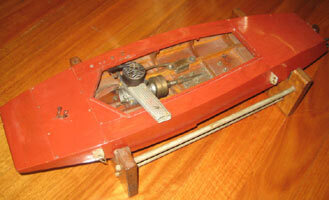 It was something of a shock when this rare example of a commercial hydroplane sold at a giveaway price.